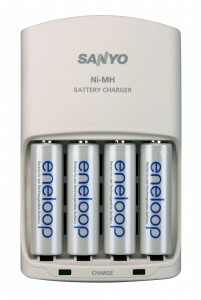 We suggest Eneloop brand NiMH batteries for AA applications. 1. Keep them cool. Heat will destroy them, and charging them is usually when they get the warmest. Don’t leave them in the sun on your dashboard or stacked together with poor ventilation. 2. They like the middle. The hardest place for these batteries to stay healthy is when they are completely discharged (at 0%), but a 100% charge shortens battery life, too. If you want to store your modern rechargeable battery, charge it to 75% and put it in the fridge or somewhere cool. Avoid discharging it completely whenever you can. These batteries have no memory effect, so discharging them completely before you recharge them is actually a terrible idea. Some manufacturers, (e.g. Apple) suggest discharging your device completely once a month. This is actually not for the battery cells, but so the computer that monitors the battery can make a more accurate guess about battery life. I personally suggest not discharging your device once a month unless the battery meter is acting erratic. Especially in your iPhone or iPad with a difficult-to-replace and expensive battery. 3. They will slowly discharge over time, even if you don’t use them. So if you haven’t used it in six months, go ahead and give it a charge to keep it from draining completely. If you leave them charged on the shelf for more than a month, plan on “topping them off” before you use them again. Some older NiMH batteries can lose as much as 20% of their charge in their first day. Most of the rest lose a few percent a week. 4. They will age from the day they are made, whether or not you use them. Three years after manufacturing a lithium or lithium ion battery, you can lose as much as half of total capacity even if you’ve never used the battery once. So don’t feel guilty about using your battery for what it was made for. And if your battery is not holding enough charge to be useful to you, there’s no magic charger or technique that will bring it back to life. Be sure to responsibly recycle it. If your community doesn’t collect and recycle batteries, consider sending them in.